Fintechs have smashed all records, raising $39.57 billion across 1,707 deals globally in 2018 according to a new report by CB Insights. Ant Financial’s $14 billion investment accounted for 35% of total funding in 2018, with Asia dominating. Raising $22.65 billion across 516 deals. North America follows with 659 investments worth $11.89 billion, both a new record. While Europe saw 367 deals topping $3.53 billion. That too a new record. Interestingly, 39% of deals were outside of the core markets (US, UK and China). South America saw funding top $540M across 55 deals, both a new record for the region. While Southeast Asia fintech startups are attracting bigger financings and foreign investors in a new potential trend. 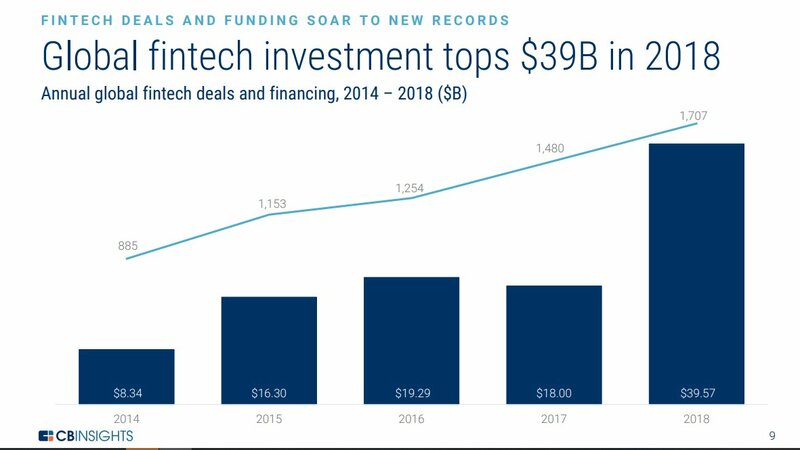 Fintechs raise a record $40 billion in 2018. Even excluding the Ant Financial mega-round, 2018 saw a jump to $25 billion from $18 billion. Up 3x in four years. There are now 39 VC-backed fintech unicorns worth a combined $147.37 billion. Two of them are from the crypto space. 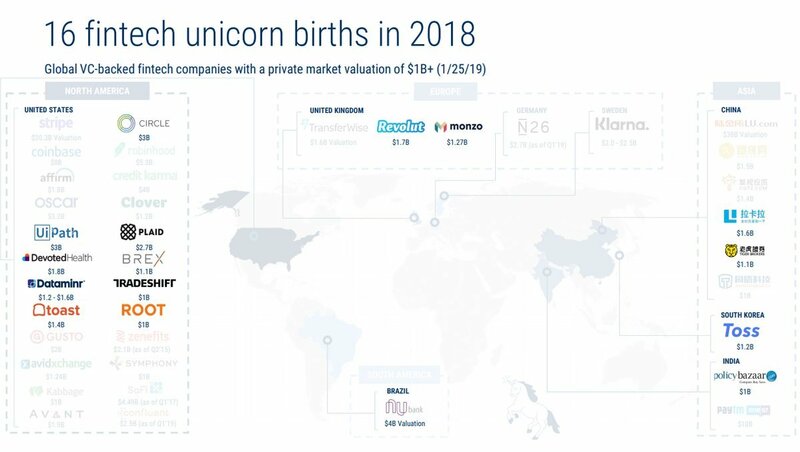 Coinbase, which has previously been valued at $8 billion and a new one that entered the unicorn list in 2018: Circle. The latter has recently bought Poloniex, entering the crypto-exchanges market. Some however might be excluded, like Binance and Bitmain which are probably worth more than a billion. Circle becomes the newest fintech unicorn, Jan 2019. Fintech meets real estate is one identified trend as financial technology start-ups try to enter the home market or indeed try to tokenize homes. Another one is the rise of new investment platforms and asset classes with Robinhood and Coinbase used as an example of new start-ups appealing to millennials due to speed and convenience. Arguably, things like Binance Launchpad where token sales can occur in a somewhat more centralized form and with some more quality control might also be a trend. Fintech, however, is a broad umbrella term with blockchain and cryptos just one part of a wider industry that is using digital technology to transform money. In that, QR codes are a big trend with all keeping their eyes on the next WeChat Pay or Ant Financial as mobile payments haven’t yet quite taken off in the west due to its widespread banking access, but they could take off in South America, Arabia, or in the rising Africa. Overall the Fintech industry is clearly booming with investors seemingly seeing opportunities to strike big as record breaking rounds are closed in Asia and elsewhere.